Seven Ghanaian soccer referees and assistant referees and one other official have been banned for 10 years to life for corruption, the Confederation of African Football said Tuesday. Another 14 referees and assistants from various countries were provisionally suspended following a meeting of CAF’s disciplinary board this weekend. The cases mean 18 African referees and assistants have now been banned in the last month, with a picture emerging of widespread corruption among the continent’s match officials. CAF announced bans for 11 other match officials last month, including an assistant referee from Kenya who was supposed to officiate at the World Cup in Russia. That official, Aden Range Marwa, was banned for life by CAF after he was filmed taking a $600 payment in a Ghanaian journalist’s documentary. He is also being investigated by FIFA. In the latest disciplinary cases at CAF, assistant referee David Laryea was banned for life while the other six Ghanaian referees and assistant referees were banned for 10 years. They included a female assistant referee. Laryea has officiated in World Cup qualifying, international friendlies, and was an assistant referee at the African Cup of Nations in South Africa in 2013. 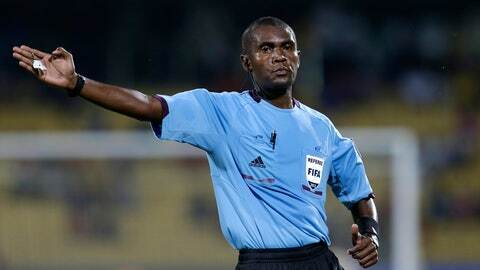 Wellington Joseph, described by CAF as a technical instructor, was the other official banned for 10 years. The African confederation said their decisions stemmed from media investigations into corruption in African soccer. CAF did not give any details of the cases and announced only the sanctions. The 14 match officials provisionally suspended pending further investigations are from Benin, Guinea, Guinea Bissau, Senegal, Congo, Madagascar, Ghana and Liberia. They include Hamada Nampiandraza, who was a referee at the 2013 African Cup of Nations. They were all ordered to appear in front of CAF’s disciplinary board at its next meeting. In May, a documentary by a renowned Ghanaian investigative journalist said corruption in soccer in Ghana and other African countries was rampant, with dozens of referees, coaches and officials implicated in taking bribes. The documentary shows a sport still operating in a murky world of bribery and secret meetings three years after the FIFA corruption scandal brought down world soccer’s biggest figures. The top name implicated in the African sting was Ghana Football Association president Kwesi Nyantakyi, who was a member of the FIFA Council and a vice president of CAF at the time. Nyantakyi was shown accepting $65,000 in bundles of cash from undercover journalists and stuffing it into a black plastic bag. The cash was referred to as “shopping money” for Nyantakyi, who was supposed to use his influence to help secure political access and favorable deals for the journalists posing as businessmen. Nyantakyi resigned from his roles and has been provisionally suspended by FIFA for 90 days while its ethics committee investigates the allegations against him. Ghanaian soccer is in crisis as a result, with the allegations of corruption leading to the government disbanding the football association.